Between the general election results and the changing management of the Texas House — where Joe Straus is retiring and Dennis Bonnen is poised to be the next speaker — the state government is getting a reboot. The Texas House is in the middle of a reboot — a change in leadership and the general mix of things that only takes place about once a decade. House Speaker Joe Straus is leaving. 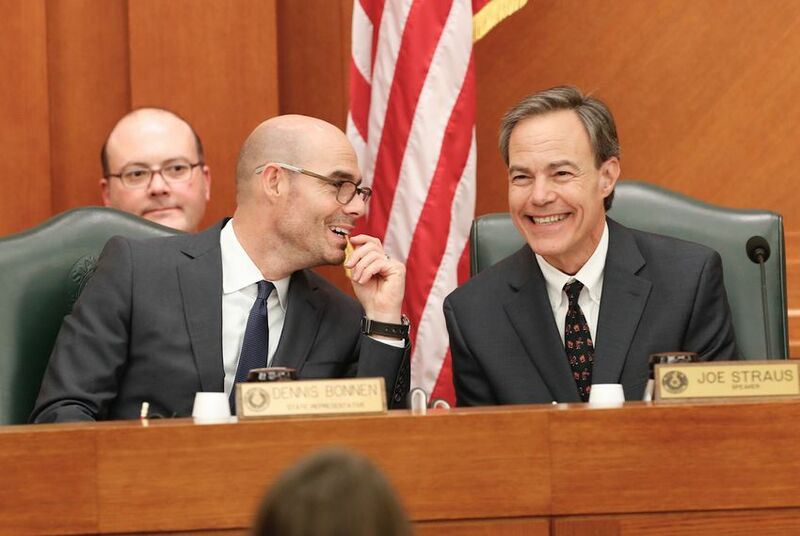 State Rep. Dennis Bonnen, R-Angleton, has collected enough promises from members of the House to succeed Straus in January, when the actual vote takes place. You can see people changing positions, rearranging their political stances for a fresh start. After a narrow election victory, the noisiest conservative in the Texas House, Jonathan Stickland of Bedford, is telling his local journalists it’s time to for him to use more honey and less vinegar. Jeff Leach of Plano, another member of the House’s Freedom Caucus — a group that had been playing loyal opposition to Straus within the GOP — quit the caucus in a public letter saying now would be a good time to try to work with all the Republicans. It’s probably unrelated, but interesting, that outside of the Texas Capitol, Republican leaders are trying to stop the local branch in Tarrant County from ousting its vice chairman because he is Muslim. And you’ve got a lot of Texas conservatives scratching their heads after a general election that saw a scary drop in their traditional suburban voting power — including in Tarrant County. Maybe it’s just the mood of a funeral week that has seen an outpouring of fond remembrance for former President George H.W. Bush, viewed in the polarity of current times as a model for comity in politics — even between friends and enemies. What’s happening in the House, though, is both real and predictable. Straus had the job for ten years. His predecessor, Tom Craddick of Midland, had it for six. The Democrats who preceded them had long terms. Pete Laney of Hale Center held the job for ten, as did Gib Lewis of Fort Worth; Billy Clayton of Spring had it for eight. Management changes regularly, but not quickly. In pre-Clayton days, speakers generally kept the gig for four years at most. A member of the House could vote for a speaker, benefit from that good choice for a couple of sessions and then try again. Opponents of a particular speaker would only be in the doghouse for one or two biennial sessions before they got another chance. Now that the speakerships last longer, the consequences of being on the right or wrong side of a particular speaker are that much greater. Leach and Stickland and the others can speak for themselves — as can the Democrats who initially split 30-37 in their support for Bonnen — but they’re in the process of putting together a new House leadership that could be in control of things for the next decade. Bonnen, like most of the speakers before him, is offering to start with a clean slate. The House has 150 members. He had 109 pledges when he announced, effectively, the end of the race to replace Straus. That was enough to say he could have won with only Republican votes — he had more than 76 of those folks on the list — but he also pulled in almost half of the Democrats, welcoming them into his fold. The state’s political donors and lobbyists have spent the days since the November election rewarding the winners with sometimes fat donations — a “late train” rush that always precedes the ban on fundraising while lawmakers are filing and voting on legislation. That blackout starts Saturday, and the cocktail, coffee and eating venues around the Capitol have been abuzz with campaign economics. The members of the House are in a similar mode, without the check-writing. If all goes as expected, Bonnen will be a unanimous — or near unanimous — choice for speaker on the first day of the legislative session. He’s hiring staff, naming new parliamentarians, signaling a willingness to work with the Senate when possible and to poke the Senate in the nose when it’s not. He’ll follow that with the overtly political act of assigning members to committees and committee chairmanships, laying out on paper his version of who’s in charge. It’s a good time to be friendly, to toss out old fights and see what’s next. You know — to reboot.